Capital flows play a key role in the transmission of real and financial shocks across countries, but empirical work on flows by sector is scarce. This column uses a newly constructed dataset of capital inflows for 85 countries, broken down by borrowing sector, to show that private debt flows are negatively correlated with global risk appetite, while borrowing by sovereigns is positively correlated with risk appetite. This and other results discussed show the importance of splitting capital inflows into their borrowing sectors when designing policy to manage macrofinancial risk. Capital flows play a key role in the transmission of real and financial shocks across countries, and the international allocation of global risk. The financial history of emerging markets shows that capital flow cycles go hand-in-hand with boom-bust cycles, and there are more frequent financial and currency crises after surges in inflows (Reinhart and Reinhart 2009, Caballero 2016). This vulnerability to shocks, as well as their propagation and amplification mechanisms, varies depending on which sectors received the capital inflows. For example, sovereign debt was the Achilles' heel in the Latin American crises, while private sector debt financed by capital inflows was the source of fragility in the East Asian crises. In the US, the culprit in the Global Crisis was the domestic household debt held by US and global banks. In European countries in the same crisis, external borrowing by sovereigns and banks played the central role. Empirical work on capital inflows and outflows by sector is rare. Most of the existing empirical work has focused on the behaviour of net flows, defined as the difference between purchases of domestic assets by foreign residents (gross capital inflows by foreigners) and the purchases of foreign assets by domestic residents (gross capital outflows by domestic agents). Recent research has shown that gross flows (i) are much larger and more volatile than net flows, (ii) tend to be procyclical, and (iii) respond systematically to changes in global conditions (Forbes and Warnock 2012, Broner et al. 2013, Milesi-Ferretti and Tille 2011, and Bluedorn et al. 2013). In a recent paper, we construct a dataset showing quarterly gross capital inflows for a balanced panel of 85 countries, and document stylised facts from the perspective of the borrower (Avdjiev et al. 2017). Our dataset covers 25 advanced, 34 emerging, and 26 developing economies from the beginning of 1996 to the end of 2014. Our sectoral breakdown splits debt inflows into four borrowing sectors: government, central bank, banks, and corporates. We do this for total debt inflows, but also for portfolio debt flows and other investment debt flows. To the best of our knowledge, this is the first dataset on gross capital inflows providing such large country and year coverage, while delivering a breakdown by borrowing sector at a quarterly frequency. To build our dataset, we combine and harmonise several public sources: the balance of payments (BOP) and international investment position (IIP) statistics of the IMF; the locational banking statistics (LBS), consolidated banking statistics (CBS), and international debt securities (IDS) from the Bank for International Settlements (BIS); the quarterly external debt statistics (QEDS) of the IMF and World Bank; and the Debt Reporting System (DRS) of the World Bank. We do this by using data from the other sources to complete the sectoral data on debt inflows that are missing from the BOP data. We focus on inflows of portfolio debt and other investment debt by sector, and incorporate data from the BIS and the World Bank on external bond and loan flows to expand the limited quarterly sectoral coverage of the BOP statistics. Other investment debt flows are important, since the vast majority of external bank flows fall into this category. Crucially, it also includes some cross-border loans to corporates and sovereigns. This greatly expands the coverage of the sector-wise inflow data found in the BOP statistics. Depending on the specific inflow type, the procedure allows us to fill 15% to 30% of the missing data for advanced economies, 25% to 40% for emerging markets, and 75% to 90% for developing countries. Our dataset captures a large volume of debt inflows by sector missing from the BOP data. 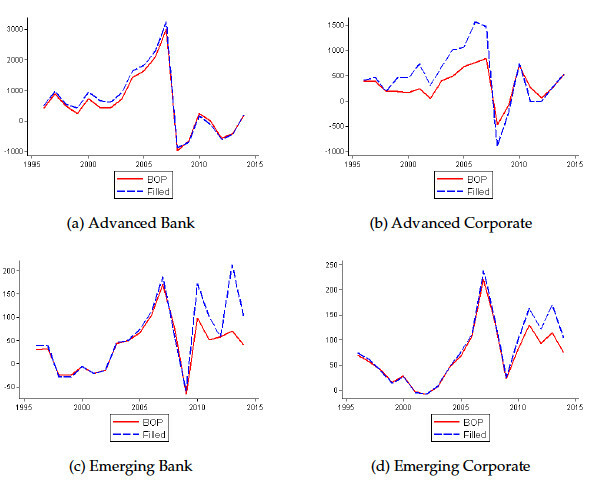 For example, using the filling data for countries like the US and Spain in our database demonstrates that external borrowing by corporates in advanced economies prior to the Global Crisis was much higher in than the BOP data suggest (Figure 1). Similarly, flows to emerging-market banks and corporates after the 2008 crisis were much larger in our dataset than in the BOP statistics, because of our filling data for countries like China and India. Source: BOP, IIP, QEDS, and BIS, author calculations. Notes: Debt is portfolio debt plus other investment debt; 'BOP' is BOP-only data; 'Filled' is BOP data plus other data sources when missing. 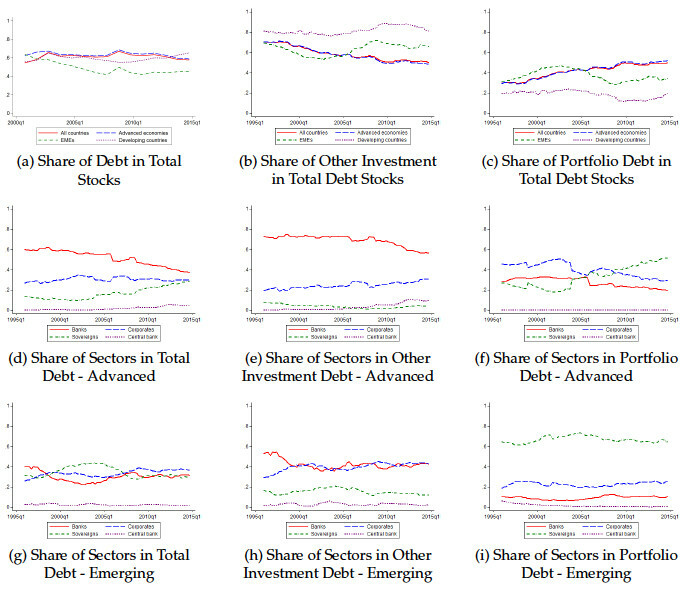 The dataset reveals that debt represents most external liabilities, except in emerging countries, whose debt and non-debt liabilities are of a similar magnitude (Figure 2). Other investment debt (typically, bank loans) accounts for most debt stocks, but portfolio debt (bonds) represents nearly half of advanced-economy external debt and about one-third of emerging-market external debt. The respective roles of the borrowers in total debt flows also vary across country groups. In advanced economies, banks account for most external debt liabilities. In contrast, in emerging markets, corporates, banks, and sovereigns have a roughly equal share of total external liabilities. Interestingly, the conventional wisdom that banks account for most other investment debt and corporates account for most portfolio debt is true in advanced economies, but not in emerging markets. In the latter case, most portfolio debt is issued by sovereigns, while the share of banks and corporates in other investment debt are roughly similar. Source: IIP, QEDS, and BIS, author calculations. We found that the empirical regularities that characterise aggregate inflows do not hold for all borrowing sectors. All private debt flows (that is, borrowing by banks and corporates in the form of portfolio and other investment debt) are negatively correlated with global risk appetite, as measured by the VIX. In contrast, borrowing by sovereigns is positively correlated with the VIX. This positive correlation is driven by portfolio debt inflows to advanced countries, and by other investment debt inflows to emerging markets. This highlights that sovereign bond markets function well for advanced countries during times of uncertainty (possibly reflecting investor flights to safety), whereas emerging-market and developing-country governments increase their loan borrowing during such times, given the risk premium on government bonds. Instead of the usual pattern of most flows moving together, we find that debt inflows to the public sector often run counter to debt inflows to the private sector. Therefore, the public sector acts to smooth out booms and busts in debt inflows, providing an important risk-sharing role. We also find that the VIX has a negative and statistically significant impact on all types of flows into emerging markets, including FDI, which is generally considered less volatile. This is consistent with the findings of Lane and Milesi-Ferretti (2016), who argue that FDI captures a lot of investment flows by financial entities and booking at financial and offshore centres. It is also consistent with Blanchard and Acalin (2016), who find that FDI inflows and outflows at the quarterly frequency are highly correlated, and that emerging market FDI flows respond to US monetary policy. This set of results could, in part, also be because a considerable portion of FDI comes in the form of FDI debt, which captures intra-company debt flows associated with offshore debt issuance by non-financial companies. Therefore, FDI debt flows tend to behave more like portfolio debt flows than like FDI equity flows. Capital flows to emerging markets tend to be procyclical, while those to advanced economies tend to be acylical. The exceptions are portfolio debt inflows to emerging markets, which are countercyclical, and other investment debt inflows to advanced economies, which are procyclical. The countercyclical nature of portfolio debt inflows into emerging markets is mostly driven by sovereigns’ external borrowing. In turn, the procyclicality of other investment debt inflows to advanced countries is primarily driven by banks and corporates. Overall, our results show the importance of splitting capital inflows into their borrowing sectors. When we do this, we can understand better the potential risks for the destination economies. The systemic risk implications can vary greatly depending on the properties of the asset class involved, and whether banks, corporates, or sovereigns are doing the borrowing. Our data can help develop models that better fit the facts, and inform the decisions of policymakers when they attempt to manage macrofinancial risk. Authors’ note: The views expressed are the authors’ and not necessarily those of the Bank for International Settlements. Avdjiev, S, B Hardy, S Kalemli-Ozcan and L Serven (2017), “Gross Capital Inflows to Banks, Corporates and Sovereigns”, CEPR Discussion Paper 11806. Blanchard, O and J Acalin (2016), “What does measured FDI actually measure?”, Peterson Institute for International Economics, Policy Brief 16-17. Bluedorn, J, R Duttagupta, J Guajardo and P Topalova (2013), “Capital flows are fickle: anytime, anywhere”, IMF Working Paper 13(183). Broner, F, T Didier, A Erce and S Schmukler (2013), “Gross capital flows: dynamics and crises”, Journal of Monetary Economics 60: 113–133. Caballero, J (2016), “Do surges in international capital inflows influence the likelihood of banking crises?”, Economic Journal 126: 281–316. Forbes, K and F Warnock (2012), “Capital flows waves: surges, stops, flight and retrenchment”, Journal of International Economics 88(2): 235–251. Lane, P and GM Milesi-Ferretti (2016). “International financial integration in the aftermath of the global financial crisis”, IMF Annual Research Conference, November 2016. Milesi-Ferretti, GM and C Tille (2011). “The great retrenchment: international capital flows during the global financial crisis”, Economic Policy 66: 289–346. Reinhart, C and V Reinhart (2009). “Capital flow bonanzas: an encompassing view of past and present”, in J Frankel and F Giavazzi (eds), NBER International Seminar in Macroeconomics 2008, University of Chicago Press.